I run a code club at my local middle school, Ovingham. The school are building an aquaponics system, they have built the hardware but would like to automate the control of the system, this series of blog posts will take you through my attempts to automate this. I will start with just a raspberry Pi, I may move an arduino if performance reduces. 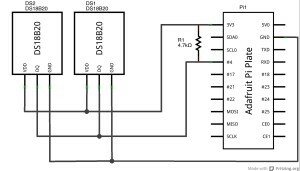 As the DS18b20 sensors use a one-wire interface to communicate with the Raspberry Pi over a serial bus we can add many sensors in parallel, the circuit I am using will therefore contain only the two temperature sensors in parallel and a pull up resistor. In order to use the sensors we need to load two kernel modules which provide the drivers for the sensors, to do this run the following commands. The next step is to read from the sensors. Save the file and restart the raspberry pi, then run the above commands again, you should now have a directory beginning 28. The address of my sensor is 000004d0f800. This should produce a result similar to the below, the last 5 digits of the second line provide the temperature reading, to convert this to degrees celsius we need to divide this number by 1000, in this case 20437/1000 = 20.437 degrees C.
My sensors are therefore working correctly and we can move onto setting up the code to read the results automatically. We want to be able to automatically read the values, to do this we use a simple python script. Now we have the data being read automatically we’d like to store the information centrally for analysis. This section will send the readings to a web service that I have created, which will allow us to then develop a website to present the information. It’s then simply a case of adding the below code to the main section of the script, within the loop so we can post the values for each device. url = "<web service address"
The values section should contain the values required in the POST call, for my service I am sending the device ID, the datetime the reading was taken and the reading. You can now run the python script and check that a new value has been added to the web server. This tells cron to run the checktemp script every 15 minutes, you will probably be in nano so press Ctrl+x to exit and save the file. Now wait for 15 minutes and check that the readings are being sent to the web service and that is it. A screenshot of the site is shown below, note some of the ‘drops’ I am looking at what can be done but this seems to be an issue with the sensors. Error handling, what happens if the web service is down? Security, how do we ensure that the web service is receiving trusted information? This entry was posted in aquaponics, Raspberry Pi, Tech and tagged one wire, Raspberry Pi, serial port, temperature sensor by JohnCat. Bookmark the permalink. This looks great!! I would imagine that other sensors such as a ph sensor will also return readings in the same format with the last 5 digits of the second line giving you the reading? 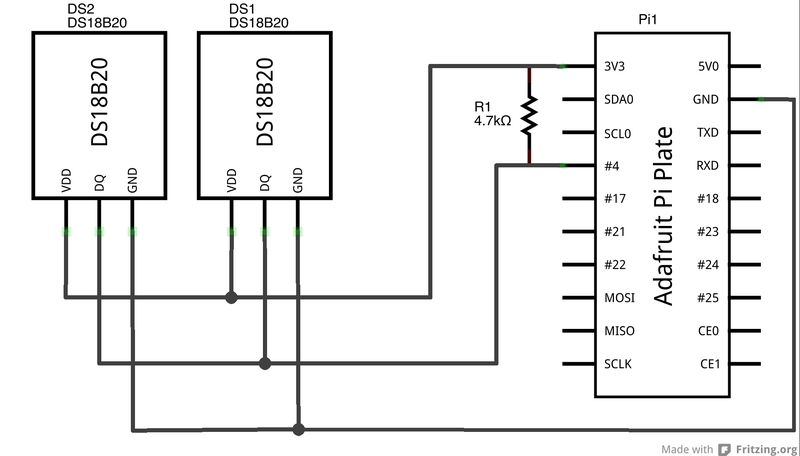 I have the pH sensor built, it actually reads the values over the serial port and posts to the web server in the same format, I’ve moved that logic into a separate method. I just need to write it up but want to get the full solution developed, including the callibration routine, which I’d like the system to lead the user through using LEDs as the intention is to have the RPi headless.